This recipe for Beer Bread has a fine grain, firm crust, light volume, nice moist quality plus a slight taste similar to sourdough. 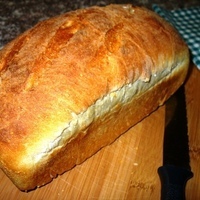 I use the bread machine as a convenience - to make the dough and proof it. Then I interrupt the cycle just prior to the baking function so I can shape to a regular loaf pan, give it an extra and final rise, and bake in the oven. That way I have a nicely shaped loaf without the gaping hole in bottom from the kneading blade. Yield: 1 pound 6 ounce loaf. Add ingredients to machine in order listed by manufacturer's instructions. Set control to 1 1/2 pound loaf setting, and light crust. Press start. Allow the bread to cycle completely through to end of baking and cooling, or interrupt cycle just before machine goes into baking mode. Follow photo tutorial to finish baking in a loaf pan. In large mixer bowl combine 1 cup of the flour, gluten (optional), dough enhancer (optional), sugar, salt and yeast; mix well. Add the water, beer and cooking oil to flour mixture and beat well 3 minutes at medium speed of mixer. By hand gradually stir in enough of remaining flour to make a soft dough. Knead on floured surface until smooth and elastic, about 4-5 minutes. Place in a greased bowl, turning to grease top. Cover, let rise in warm place until light and doubled in size, about 1 hour. Punch dough down. On lightly floured surface, pat or roll dough to a 7 x 11 inch rectangle. Roll up from longer side tightly, pressing dough into roll with each turn. Pinch edges and ends to seal. Grease a medium loaf pan (8 Â½" x 4 Â½") and sprinkle the bottom lightly with cornmeal. Place the loaf seam-side down into pan. With a very sharp knife make 3 or 4 diagonal slashes across top. Cover, let rise in warm place until nearly doubled in size, 30-40 minutes. Bake at 375 degrees for 25-35 minutes* or until golden brown. Remove from pan and cool. * NOTE: Darker pans require less baking time so begin to check doneness at 25 minutes. It was delicioous! Thank You Salad Foodie! Never going back to sourdough starter now! I used Samuel Smith Oatmeal Stout "Tadcaster" which is a dark fragrant beer not to bitter. I did not use the Vital Wheat Gluten. I could not find Dough Improver. I made a Focaccia with the dough and just wait till you see the pics!